Good Wednesday evening, my peeps! First off, to my Friday Ficioneer Friends, I apologise for not getting to all of you last week. Was one of those weeks. I shall strive to do much better this week, I promise! Our Fabulous Fictioneer Facilitator, Rochelle, has chosen one of my photos. Hmm… wonder where she “snagged” that one from? All good. I did give her the A-OK, of course! Should this cute decor inspire you to write your own 100- word story, please do and add your link by clicking on the blue frog below. It’s a fun challenge and really teaches you to cut the fluff! They had arranged to meet at a bar/restaurant on the happening street of town. For most, it might seem weird to meet close to midnight but when you worked late shifts, this is what you did. No biggie, they were both night owls. She got there early and waited by the entrance. She’d never noticed the umbrellas before. How cool! She snapped a few pics, shared them on Instagram and waited. Over half-hour late. Starting to feel uncomfortable, and getting certain looks designed for a “working woman”, she chose to wait in her car. This entry was posted in Friday Fictioneers, humour and tagged Bungalow Bar, dating, Instagram. Bookmark the permalink. Umbrellas were colourful. Where was her friend? He was just late… took too long primping! Making you wait, and you forgive him?, Atleast he should buy you an umbrella. Let’s just say things did not start off on the right foot… first impressions being what they are, he did not give her a good one. Ah, the late date. Next! Darn tootin’! If you can’t be on time for your first date, what does that mean for anything else? Thank you, Fandango. And that is all good and well! Many do post on Fridays! Hence the name, the lunatics have taken over the asylum!! Great story for a great photo well done!! Great post Dale, a familiar story for all at one time or another, I guess he realised he was late and sent her accusatory text asking where she was, the subtext being she got the wrong place to undermine her confidence. He should have called well before, where’s his manners? There’s rules of attraction!! My original ending text was “Sorry I’m late!” Which would have changed the whole subtext, eh? Obviously he did not follow her on Instagram otherwise he’d be there. Nice turn at the end. But then this is what happens when you are not specific, imagine meeting at a bar/restaurant , I mean’ which one. As someone who’s made so many confusing mistakes ,sort of like this one, over the years, I understand the frustration. She’s smart to leave. Let’s just say the dating scene is not what it used to be… I can’t say I’m enjoying this at all.. There is a word for dudes such as this. Amateurs. For those of us who do our homework, there really is no excuse. It’s a simple matter of dotting your italics and crossing your tenderness, and most of all . . . being early for a first date. Not on time, and most certainly not late. And to think he ruined the juji fruit hanging from the ceiling! Because those umbrellas are such a brilliant mood setter. To being early, and having a clue. There really is no excuse at all. When you’re given a window of time, the least you can do is arrive some time within that window. I know right? And don’t make it a cathedral sized window at that . . I mean, hell! Right! Cathedral-sized window indeed… I mean… Let’s meet between 6:30 and 7:00 (let’s pretend, here) – half an hour? WTF? And you’re right. Early is on time. A half an hour time window? What . . does this dude work for the cable company? Yes, early IS on time! My motto . . . I know, right? So even if you arrive in that window and he’s already there, you feel like you’re late!! This is gonna sound sexist (mayhaps) in this day and age, but remember . . I am of a certain age so there’s that. A lady can be late. A dude should never be. Hey . . it’s perfectly acceptable for a lady to make an entrance. If you hate being late, that’s a whole ‘nother thang. Making an entrance is one thing… doing it late? Not cool. 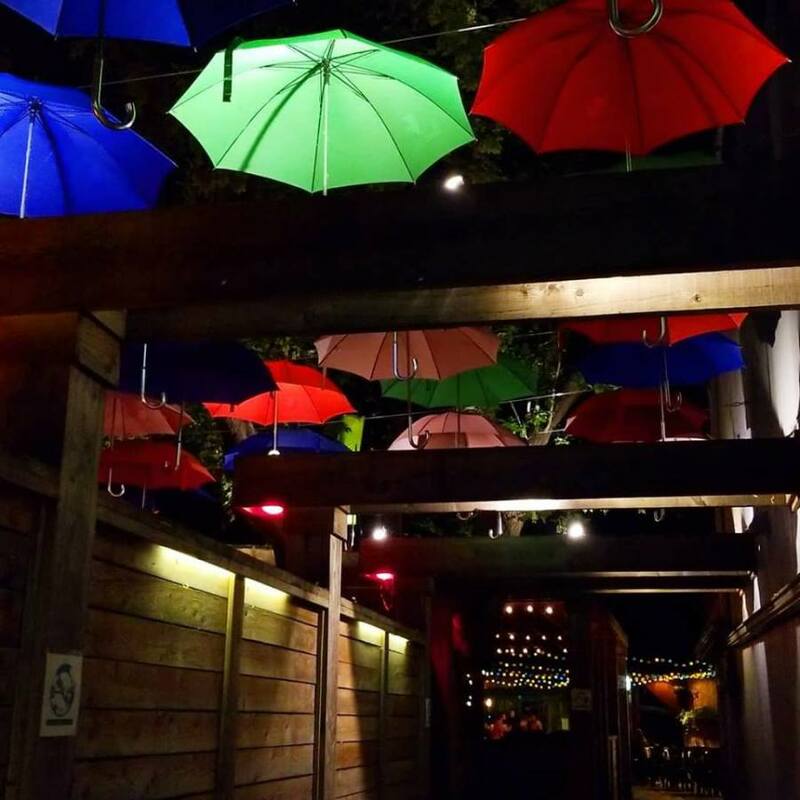 Also–it looks like a cool place with the umbrellas. It is a great place. Perfect for summer cocktails outside. Ha ha! Actually, it’s a great street with a bunch of bars and restaurants. This place is called The Bungalow Bar and I loved the oh-so-simple yet lovely decor! More like a non-happening street! Nice one Dale. Great photo, by the way, thanks. Glad you enjoyed the photo and you are most welcome. Thank you for your lovely comment, as always. You’re great for my writing ego! after waiting for that long, she should have left. Standing at the entrance late in the night and getting weird looks must have been so uncomfortable for a lady. She deserves an apology from him. She could actually be at the wrong place all together. Especially if there might be “working women” in the neighborhood. Perhaps he didn’t want to seem too anxious. I’m surprised she waited as long as she did. Right… and so am I, to tell the truth. The lovely ones are few and far between, so I do treasure them when they come. Waiting – I remember doing that in my youth. I wouldn’t do it now! That’s a nice pic! I don’t know about the dude … with technology and all he could have called … being late is a burn. Shew…thought she got stood up for a moment. That would have sucked big time! Brilliant idea to call it a night and move on to other more considerate prospects. Fabulous photo, so something good came of it. So very glad you enjoyed my photo and story…. The issues of working late, one never knows when one might get stuck at work. Been there….Hopefully communication took over? So true. And, whoever thinks women take more time to primp, never met this guy! Half an hour late (without a text of apology five minutes in) is plain bad manners. If he was just careless about the time, that’s wrong. If he was nervous and plucking up courage, that’s disappointing. Next! That is all true. Next! I really liked it! I can identify as a fellow night owl that there’s a trade off when you’re out by yourself past midnight- you get the city pretty much to yourself but passers by will assume you’re a degenerate for being out so late. You captured that with her awkwardness after waiting around. I’ve never really seen that expressed in writing before. Some people are just drawn to the night 🙂 doesn’t mean their thugs or prostitutes haha. Power to the Night Owls! Great story! Hear! Hear! Jacob! It is lovely to walk at night and no, it does not mean we are all n’er-do’wells… Glad you enjoyed my story. There’s a certain beauty that’s unique to nighttime, I was glad to see it expressed in your story. Am very glad you felt it. I don’t know, there’s something to be said about the time and effort he put into his primping to look good for her. It may have not won her over though.